With over 30 years' experience in the business, we install a range of products from trusted leading manufacturers, guaranteed to provide you with a top quality product that you will enjoy and benefit from for many years to come. Double glazing -v- triple glazing: what’s the best option? Door dilemma: composite -v- uPVC – what’s the difference? What is an insurance backed guarantee and why do I need one? Triple-glazing is often marketed as a better option than double-glazing, especially when it comes to thermal insulation. But is this really the case? If you look at the websites of the big nationals for instance, you could be forgiven for wondering why so many companies are still even selling double glazing when triple glazing appears to be so much better at insulation and soundproofing your home! Here we attempt to debunk many of the myths that surround triple glazing, and clarify the facts to help you make an informed decision that’s right for you. 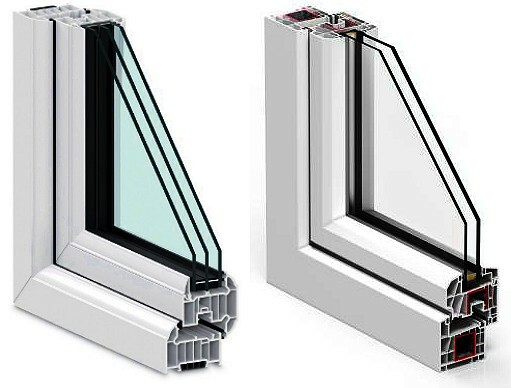 Example of a triple glazed sealed unit and a double glazed sealed unit. While it’s true that triple-glazing does offer some benefits, it may not be the best or most economic solution for you. Triple glazing is a better insulator for your home than double glazing. The energy performance of windows is measured in U-Values. Lower U-values = a more energy efficient window. Traditional single glazed windows can have a U value in excess of 5. Building Regulations now stipulate that modern double glazing should have a U-value of no less than 1.6. U-Values for older double glazing used to be much higher. However in recent years the manufacturing process has been greatly improved to provide much more energy efficient units. These improvements have been brought about by the introduction of wider cavities between the two glass panes, low-emissivity coatings being added to the glass to stop heat escaping (glass such as Pilkington K or Planitherm Softcoat Total), the cavity being filled with an inert gas (usually argon) and the use of warm-edge spacer bars (instead of aluminium). Triple-glazing enables window manufacturers to achieve U-values of 1.0 and lower. So yes, triple glazing can enhance heat retention. But such U-values are really only of benefit when they are installed into an overall energy saving build, such as in a low energy house or a “passive house”. Where windows are being fitted into a standard build or as part of a refurbishment project then sealed units offering U-values as low as 1.1 are preferable and easily achievable with double glazing. With the exception of perhaps the northern reaches of Scotland, the rest of the UK is simply not cold enough to warrant the use of triple glazing. Scandinavian countries such as Iceland, Sweden, Norway, Finland and other far northern countries use triple glazing because temperatures such as -20° C can be quite frequent. Highly energy efficient windows and doors, triple and sometimes quadruple-glazed are absolutely necessary to help reinforce the fabric of the buildings against the cold. As far as the UK is concerned, there are many who argue that triple glazing simply doesn’t make sense in our climate. It is more costly to produce, produces much heavier sections and has an embodied energy approximately 50% higher than double glazing. Why would home owners pay more when good double glazed windows would easily tick the box? Triple glazing is a better sound insulator than double glazing. One of the biggest selling points of triple glazing has been its ability to reduce noise and outdoor sound. The thickness of the glass used is one of the three key elements of the sound insulation. Different thicknesses of glass will block a different frequency, so a combination of panes of varying thickness is more effective at keeping noise out. This is known as asymmetrical glazing. However, (and somewhat ironically!) most fabricators currently appear to offer triple glazed units with standardised cavities and glass thicknesses. The second key element is the size of the gap between the panes. The larger the gap, the better the overall sound insulation effect. Finally the use of an acoustical resistant gas to augment or replace the inert gas (usually argon) will effectively help reflect noise away. If sound insulation is important to you then it would be worth considering acoustic glass sealed units (such as Pilkington Optiphon or St Gobain’s acoustic glass, both of which are laminates) or even secondary double glazing instead. Secondary glazing will have a much greater air gap than can be achieved in triple glazing, and can achieve great noise reduction at considerably less cost. Triple-glazing offers low U-values suited to specific low-energy and “passive house” projects and can return the value of your investment when fitted as part of these specifications. If asymmetrical glazing is used together with acoustic glass, some noise reduction can be achieved. Reduced light penetration due to additional layer of glass. Minimal savings in energy bills in comparison to the higher cost. Benefits such as noise reduction and solar control can be included in double-glazing for less than the cost of a standard triple-glazed unit. Overall greater weight than a double glazed unit could pose problems for your windows – sashes dropping can be an issue. Posted on 21st June 2017 21st June 2017 Categories Doors, General articles, Glass and glazing, WindowsTags acoustic glass, double glazing, heat insulation, sound insulation, thermal, triple glazingLeave a comment on Double glazing -v- triple glazing: what’s the best option? Doors have come on a long way in recent years, but it’s the subtle new features that can make a big aesthetic difference to your home. 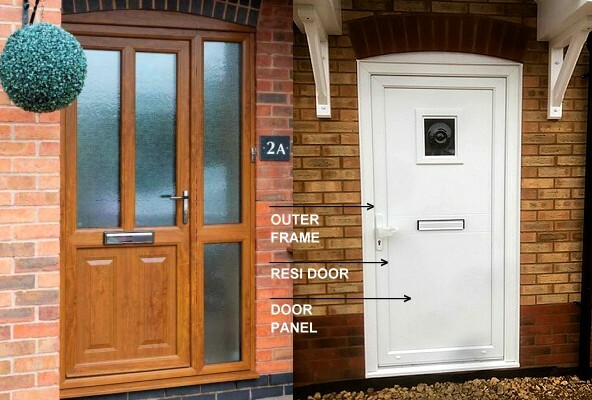 So what is the difference between a composite door and a uPVC panel door? Quite simply, composite doors are designed to look like a painted wooden door. They are a single door with an outer frame and a threshold. You can have a choice of colours both inside and outside. Visually, a composite door looks much more like a traditional wooden door. 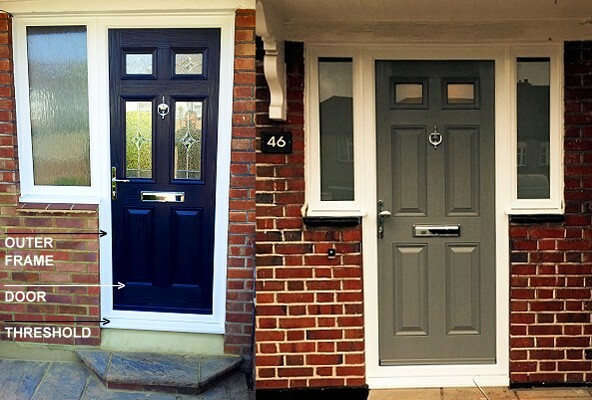 Two examples of composite doors with sidelights. Smooth white uPVC outer frames and coloured wood effect traditional style composite doors. These come in two main options, either with a full panel (usually decorative) or they can have a midrail so the door can have a half panel at the bottom and glazing at the top. For panel doors, essentially instead of having glass in the door you have a panel. With a resi door you also have an outer frame and threshold. Resi doors can come in smooth or woodgrain foiled finishes. Two examples of uPVC resi doors with door panels. LEFT: Half panelled door in oak effect foiled resi with midrail and decorative panel to lower section and matching glazed sidelight. RIGHT: Full panelled resi with decorative cottage style panel in smooth white. In our opinion, panelled doors are a more cost effective solution but composite doors are much better looking! One of the most obvious differences between a composite and a panelled door is the look of the panel. Despite much improvement over the years, panels still have a somewhat “moulded plastic” look about them. And because the panel is fitted into the door, you have a somewhat heavy framed look, almost a “door within a door” look. Sometimes you can see a gasket line between the actual door and the panel itself, too. 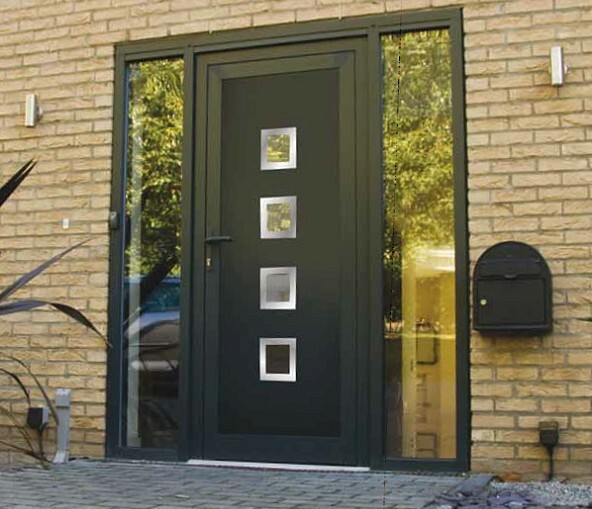 Composite doors generally have a much better aesthetic overall. A contemporary panelled door in black/brown with sidelights. Panelled doors have improved greatly in recent years – this example is stylish and modern. But because the panel is fitted into the door, you have a heavy framed aesthetic which looks almost like a “door within a door”. A panelled door is more cost effective than a composite, so if you are on a tight budget and really want that new front door then the panelled option might allow you to do this. 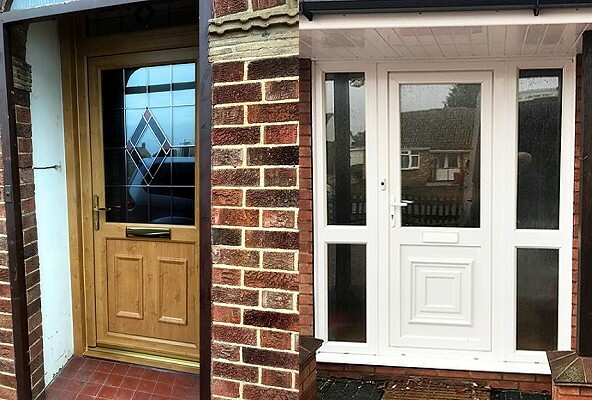 To be perfectly honest though, we would always recommend you opt for a good composite front door if you can, even if it means having to wait a while. Many customers get their windows replaced and then will have a new front door installed the following year or a few months later. These are more popular than a full panelled door and depending on the choice of panel, can actually look quite stylish. Panels are available in a range of colours with either flat or decorative options and are a cost effective choice for both front and back doors. Half panelled doors. LEFT: Smart looking resi with midrail in Irish oak foil. Decorative moulded panel to lower section, glazed with leaded stained glass to top section. Gold lever handle and letterplate. RIGHT: Smooth white resi with midrail. Decorative moulded panel to lower section, glazed in obscure glass to top section. Complementary sidelights. White lever handle and letterplate. THE YALE-STYLE RIM LATCH = KISS GOODBYE TO LEVER HANDLES ON YOUR COMPOSITE DOOR! 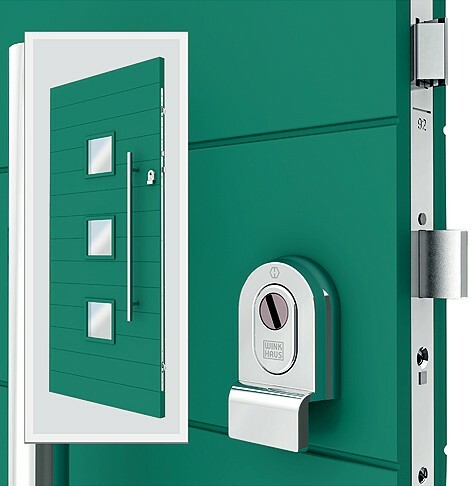 Multi-point locking doors have always been defined by their lever handles, there’s been no getting away from the fact; the handle is used to engage the multi-point locking system. Traditional wooden doors would have a Yale (or similar style) rim latch lock, where you would pull the door shut when you left the house. Now stylish escutcheon multi-point rim latch locks are available for composite doors. Operated with a thumb-turn mechanism from the inside, which activates the multi-lock when you are in the house, these new locks are the perfect answer for a modern, maintenance-free traditional style front door. Yale-style rim latch locks are now a popular choice on composite doors. Unlike a Yale lock though, the rim latch acts as a multi-point lock, securing the door into the frame at a number of points upon closure. Operated by a simple thumb-turn mechanism on the interior of the door, the multi-lock is engaged as soon as the door is shut (known as a slam-shut). This is the Winkhaus Heritage multi-lock which is available on our Hurst composite doors. Quick, simple, secure. Still not sure which to choose? Why not get some expert advice and give us a call on (020) 8868 1133 – we will be more than happy to talk you through all the different options available to you. Posted on 23rd May 2017 23rd May 2017 Categories DoorsTags composite doors, doors, double glazed doors, front doors, residential doors, uPVC doorsLeave a comment on Door dilemma: composite -v- uPVC – what’s the difference? Here at Ruislip Windows we believe in offering our customers a choice. That’s why we install bifolding doors and sliding patio doors from top manufacturers such as Crown Sapa, Aluk and our premium range from Raynaers Aluminium. Bifold doors literally exploded onto the market a few years ago and saw a huge surge in popularity. And now the latest sliding patio doors are a far cry from the sliding doors of old, offering much wider, contemporary profiles, so the question is, which door do you go for – bifold or patio? 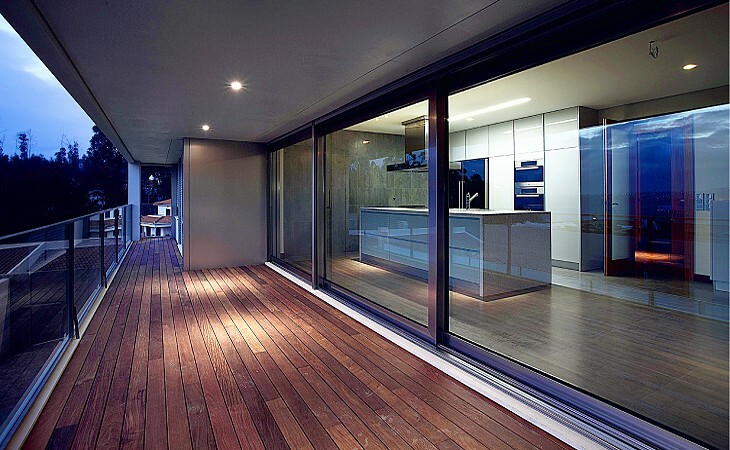 The main advantage of bifold doors is that they allow for whole walls of glass to be opened up completely. However, they can be quite frame-heavy, meaning less glazing, and the stacked door panels when open can provide quite an obstacle to the more modest-sized patio or kitchen. Sliding patio doors are shaking off their somewhat less than trendy associations of the past and are now a hugely popular choice in contemporary homes. They provide lots of light thanks to narrow frames and wider expanses of glass. Having no door sections to fold back, they save on space and provide visually “cleaner” lines. 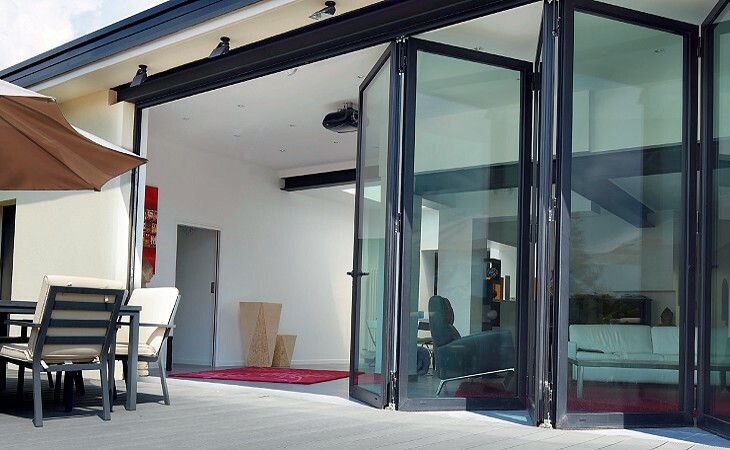 Bifold doors remain a hugely popular choice but industry experts now feel that an increasing number of homeowners are opting for the new contemporary style sliding patio doors. Raynaers aluminium sliding patio doors. Sliding doors allow larger panel sizes in wider widths, giving a maximised expanse of glazing when closed. Look at the all those lovely marketing photos of bifold doors and you will usually see a door that has a flush threshold – a continuous floor with no step between the inside and outside. In reality, most bifold doors come with a choice of different threshold options, the reason being that there is a trade off between the height of the threshold and the level of weather resistance the door can offer. So whilst a flush threshold can be achieved, it is not usually recommended, thanks to the good old British weather! Doors with the best weather ratings will always have a higher threshold to step over. It is certainly worth considering how exposed your door will be to the elements, but rest assured that most people find there is a satisfactory compromise using one of the intermediate thresholds. Posted on 4th May 2017 23rd May 2017 Categories DoorsTags aluminium doors, bifold doors, double glazed doors, patio doors, sliding doorsLeave a comment on Bifold doors -v- sliding doors – which to choose?